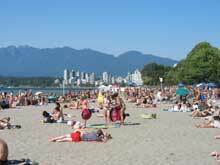 The Kitsilano Beach - one hot Vancouver beach / Pictures. 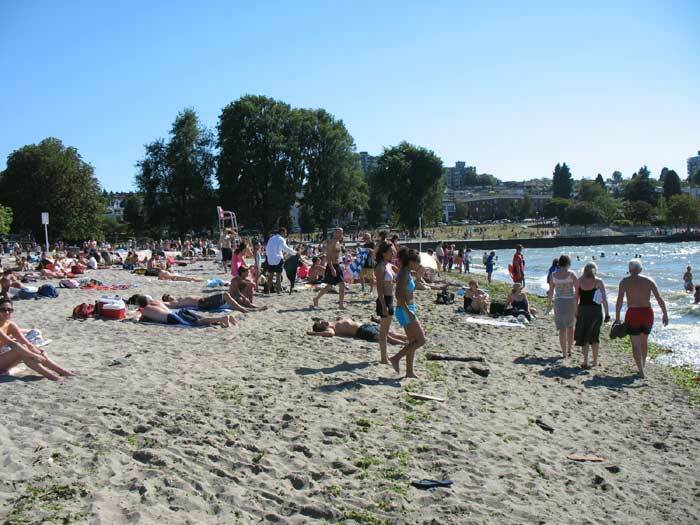 Kitsilano Beach, located at the North End of Yew Street, has long been a place for water-lovers to gather and enjoy the sunny days. 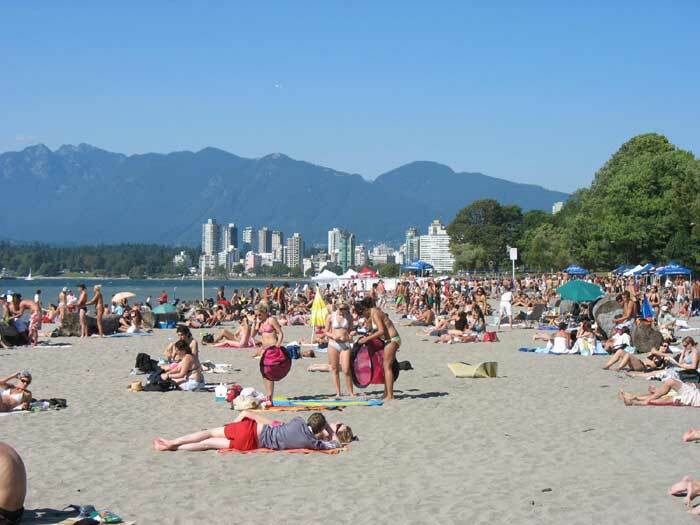 Vancouver is truly the city that has it all – from snowy mountains in the winter to warm, welcoming beaches in the summer months. 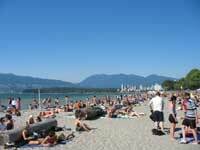 The area where Kitsalano Beach Vancouver now sits once belonged to the Canadian Pacific Railroad (CPR). Prior to that, many privately-owned homesteads sat at that location, until they were claimed by the railroad in the 1890s. The CPR never actually developed the sight, so private citizens rallied to take the land back and named it Greer’s Beach, in honor of a pioneer who challenged the railroad to retain his land but failed. The Vancouver Park Board joined in the efforts and the area soon became a favorite hang-out for water-lovers and sun worshipers, especially the teens to thirty-something set. While many visitors may wonder why it’s necessary to have a pool on the beach, the answer can be summed up in one word – “heated.” The waters of the Northwest can be quite cold so this amazing pool, located at the water’s edge, allows locals a chance to swim and have fun while enjoying the views of the beach. The original pool, built in 1936, was not heated but was replaced in 1979 by a huge tank which holds salt water and is warmed to a comfortable temperature. This 137.5 metre-long (451 foot) pool has a gradual descent, so it’s perfect for families with small children as well as experienced swimmers. 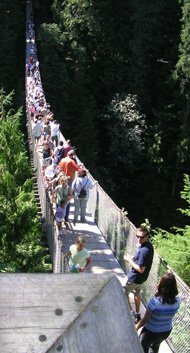 There’s an entrance fee but it’s quite minimal, making it an affordable day-long place to enjoy part of your Vancouver vacation. 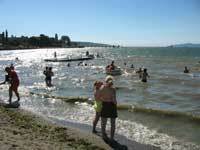 Lifeguards are on duty from late May to early September and full shower and bathroom facilities are available. A concession stand offers quick bites to eat, including yummy salmon burgers. 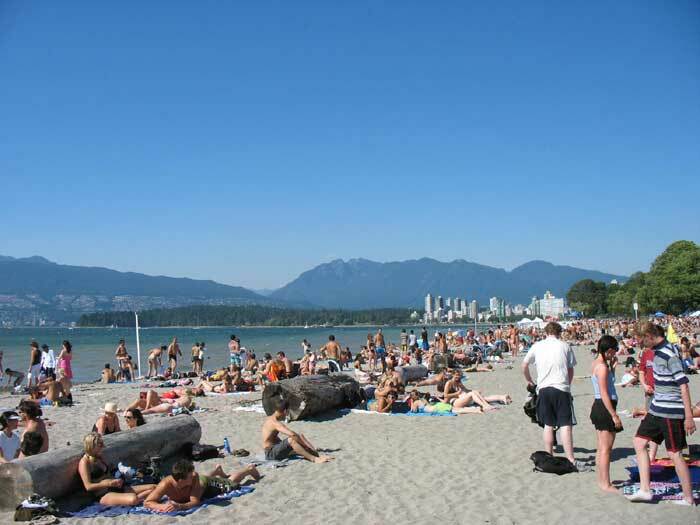 Kitsilano attracts a large number of leisure-seekers each and every sunny day during the warmer months. On particularly nice days, it can be hard to find a spot of the sand! You’ll want to come early to secure both a place on the sand and a parking spot. 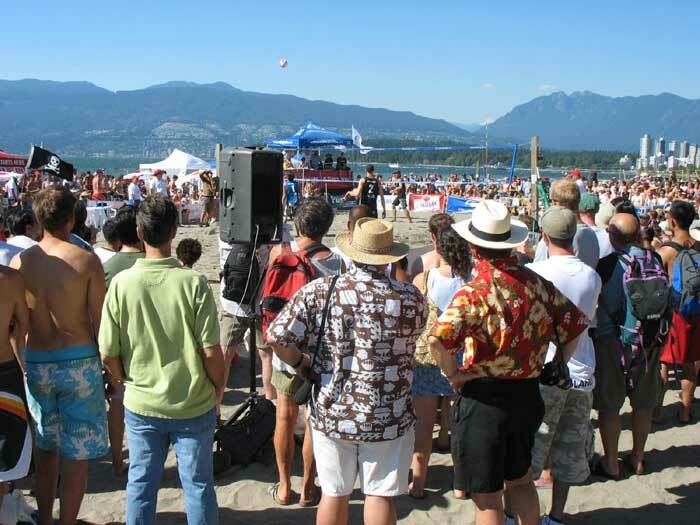 In addition to stretching out on the sand and sticking your toes in the water, you’ll find basketball, volleyball, and tennis courts here as well. The little ones will enjoy the seaside playground, designed especially for their pleasure. 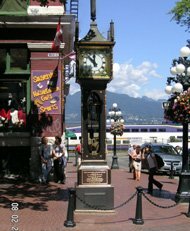 An outdoor amphitheatre, known as the Kitsilano Showboat, provides free entertainment to beachcombers and has been doing so since 1935. Visitors will be treated to musical programs, from contemporary to classical, dance troupes, comedians, and so much more - all at no cost. Kitsilano Beach Vancouver Canada is just west of the south end of Burrard Street bridge, adjacent to the HR MacMillan Space Centre/Planetarium. Remember, you’ll want to arrive early if you’re heading for either the beach or the pool.